Roderic O'Connor emphatically turned around the Newmarket form with Dubawi Gold as he led all the way to win the Abu Dhabi Irish 2000 Guineas at the Curragh. Joseph O'Brien, registering his first Classic success, gave his father Aidan's horse (7-2) a masterly ride, kicking on from the front and resisting the late charge of the favourite, who was held up at the back for much of the way, by three-quarters of a length. Oracle was third for the Ballydoyle team. Roderic O'Connor finished only 11th in the English 2000 Guineas in the wake of the blistering pace set by Frankel, with Dubawi Gold taking second spot. The winning trainer said: "We're delighted with Joseph - he got the pace right. He gave him a lovely ride. "This is one of those days that you couldn't dream about happening. I can't explain just how delighted we are. Joseph works very hard and he knows this horse well. All credit must go to the owners for giving him the chance. "The horse is very brave and stays very well. They went full throttle at Newmarket and he just blew up after two furlongs - it can happen with a horse first time out. Joseph knew that wasn't his true running." Of Roderic O'Connor, he added: "The plan was either to go to Epsom or France, and he's a strong possible for either." 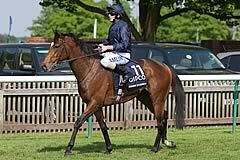 O'Brien jnr, who will be 18 on Monday, added: "He jumped smartly and travelled nicely. He's very genuine and stayed on to the line. "The ground was very fast at Newmarket, but he handled the track today very well. The stiff mile suited him well - I didn't see another horse all the way. He picked up from the three-furlong pole. That's about my 60th winner now and this is what you dream of." Dubawi Gold's handler Richard Hannon said: "I don't want to say too much, but why he (Richard Hughes) sat coming out of the stalls I don't know. He was a long way behind and the horse should have won. He's a good horse and there'll be other days, but you don't get to win a Guineas very often."